*Hi, we're from Dirt Devil. 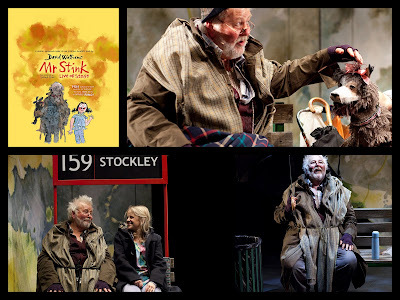 Would you and Jake like to come to The Lowry to watch Mr Stink by David Walliams? We've got a bit of information about our latest cleaning range too and a great workshop for the kids to attend whilst you're listening to the boring stuff. It took about 2 seconds between the email landing and me replying to accept the offer. 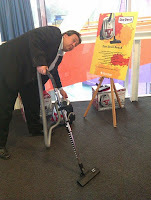 And what a fabulous idea - a cleaning company and a scratch-and-sniff experience at the theatre (more about that in a minute). how long my hose is? 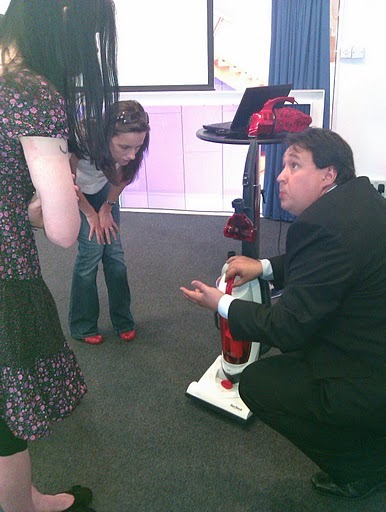 Vacuum cleaners have always had to work hard in our house - over the years there have been three children (and their respective friends), various pets, now two grandchildren... the floors take a bit of a beating from time to time. Also in this house we've got a serious lack of plug sockets so have have trouble cleaning the porch or the stairs without stretching any vacuum cleaner to its absolute limit. So I was pleased to see that Dirt Devil has produced the "Reach" which boasts a 13m cleaning radius (5m cord, 6m hose and 2 x 1m extension pipes). That would definitely allow me to do the whole of the downstairs and the stairs before unplugging and carrying on upstairs. The newest addition to their upright range - the "Pure" - has a 1900W motor and its nifty little fold-away handle ensures that it stores away in a small cupboard rather than having to stand under the stairs or in the hallway (where ours currently resides). I've always preferred an upright as, no matter how long the hose is I always end up bending over and making the task in hand much harder (oh god, the innuendo... can you imagine what the actual hour demonstration was like?). I found it hilarious that Cara and Claire hadn't used uprights before and they did seem to take a vested interest in what was going on. There's lots more information about the products on the Dirt Devil website and if you click on each of the images below you can find out all about what they do, the price range and where they are stocked. After a spot of lunch our children were returned to us and we all went through to The Quays Theatre within The Lowry to watch the matinee performance of Mr Stink (written by David Walliams). The book has been adapted into a musical and each audience member receives a scratch-and-sniff booklet when they enter the theatre. This ingenious method of participation allows you to become part of the show without leaving your seat and the creative team behind the scratch-and-sniff experience really have the smells down to a tee. The Mr Stink story is based around a young girl befriending a tramp, the similarities and differences in their lives and sensitively covers family problems, homelessness and bullying. The five cast members, additional stage hands/puppeteers and the simple but effective set made for a very enjoyable afternoon and kept everyone from a 20 month old (with well timed interjections such as "Dada? Dada?" and "O-Oh") right through to all the adults entertained. Many thanks to Brazen PR for their "unimaginable kindness" (Mr Stink reference there) in organising a genius collaboration between Dirt Devil and The Lowry (and I got to see the brand new MediaCity down on Salford Quays too - it's changed so much down there in the past few years). We had a wonderful afternoon and, at the end of the day, Dirt Devil gave me one of their Easy Handheld vacuum cleaners (see pic above) which has already proved great for stairs, the car and under the radiators. They also filmed me talking about the day too so when that has been edited, I'll link it in.